Now imagine you have to go out for some time, say two or three hours. You will have to switch off the air conditioner, to save electricity and cut down costs before going. But by the time you come back, there will be absolutely no cooling left in your room and you will have to wait for probably more than half an hour after switching on the air conditioner, for it to get the room's temperature to a bearable point. 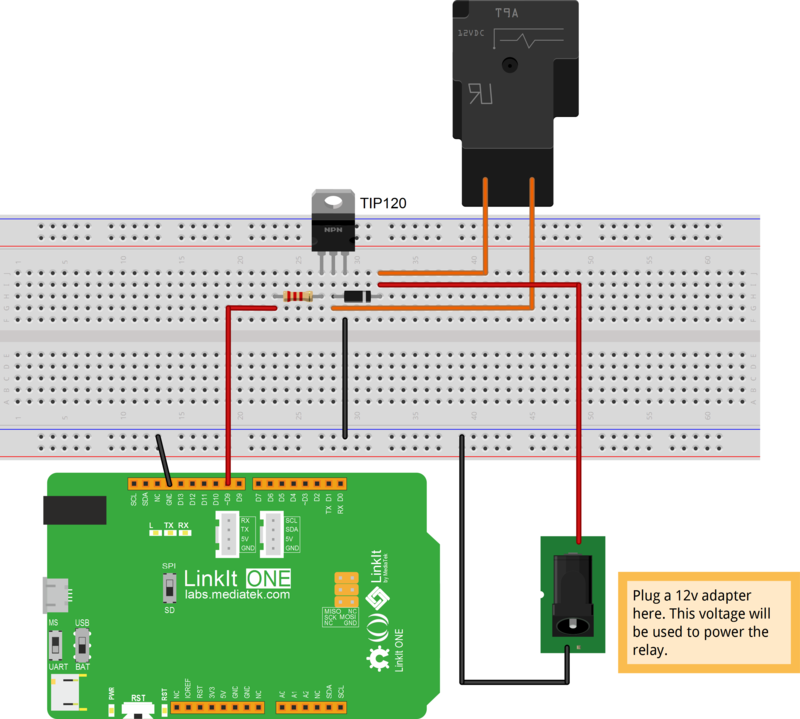 Looking at the above scene, there is a solution for this, using an Arduino UNO, along with some shields and peripheral devices (bluetooth module,etc) by using the WiFi shield, and a relay, by switching the relay on when you are about to return to your house, approximately half an hour before your arrival. But MediaTek's LinkIt ONE can provide an even better and robust solution, considering its features. Here's a photo comparing the UNO with the LinkIt ONE. You will certainly say there is not much difference (other than the brilliant color scheme, of course! ), but when you know the actual features, you will be dazzled. The main features of this board, which make it the perfect candidate for this project is WiFi, Bluetooth, GPS, GSM and a micro SD card slot, all integrated in a compact package, comparable to the Arduino UNO. And along with that, you get ample space for coding and a generous amount of RAM (for a microcontroller of its size) to execute your code, without lagging, as there is on the Arduino UNO, when used with with bigger and more complex codes. So, given a hint of the awesome features present in this board, let us proceed to the main project. I had initially thought of using the Arduino UNO for this project, but was unable to do so by the cost (Shields were expensive than the UNO itself). But then came the LinkIt ONE, a board designed for wearables and IoT and so, I planned to make the above proposed project with the LinkIt ONE, with additional features, such as being able to receive the temperature and humidity, along with values from a smoke sensor which can alert me when there is a fire, or smoke present in the room. For example, the Grove relay from SeeedStudio, shown below, can safely be used to control appliances which take a minimum of current, for example a 220v lamp or LED. From its documentation and the printing on the relay we can see that its peak voltage capability is 250v at 10 amps. Another relay is shown below. This one is also available from SeeedStudio. From the above two options, I chose option 2. This was because the switching circuit is very easy to build and I had the parts available too. Another thing is that relays are considerably slower as compared to electronic circuits. And the main reason was the the small relay had malfunctioned. Wire up the relays so that when the coil of the smaller one is switched on, via the LinkIt ONE's digital pin 9, the coil of the bigger one gets switched on, and with the load circuit of that, you have to connect your AC. In short, wire it so that just switching on digital pin 9 on the LinkIt ONE will switch on your AC. You can look at the image posted above for this and that should give you and idea. I will not explain this in more detail, because if you do not understand this, this project is not for you and it will do you good by leaving this project and coming back when you are more confident about your skill of electronics. You can test it on a breadboard first and then build it on perfboard. The breadboard Fritzing schematic is given below. I had tried a lot to find the Fritzing schematic for the LinkIt ONE but was unable to do so. Then I made an SVG file of the LinkIt ONE, using the picture given in the official MediaTek SD Card Tutorial as a reference. Below are pictures of the complete project. I have put them here just because you can have an idea of the wiring of the AC to the relay. To know more about the sensors, just read on. But because the library which I used for the DHT11 sensor supports using the DHT22 sensor, I think it is possible to use that with some minor modification to the code. I myself think that I will use the DHT22 (Once I receive it), as from what I heard, it is more accurate than the DHT11, because with the DHT11, you can only receive values in whole numbers, not decimal places. But the DHT22 is accurate enough to display values in decimal points. But for now, let us continue using DHT11. The schematic diagram is attached below to wire the sensors. Just use that as a reference and attach them to the LinkIt ONE. And attach the WiFi/BT and GSM antennae to the LinkIt ONE. There is no use for GPS, so it is not necessary to attach that. Also, attach the SIM Card to the LinkIt ONE. You will need to create the prototype and the data channels exactly as I say, or your data points will not be uploaded to MCS. If your data point page looks exactly like mine in the image below, move on to make a test device for your prototype. You have successfully set up your MCS account and can move on to the next step. Optional: You can also use triggers with the Mediatek Cloud Sandbox. To do that, you can just click "Trigger and Action" and set a trigger for a datapoint, which will inform you via an E-mail, or via a push notification, if a certain data-point is a above a certain value, but you will need to set that up first. I have not done that for this project, because that should be different depending upon everybody. You can set it up according to your needs, but even if you do not, it should still work! At the end of the previous step, I had told you to copy and save the 'Device ID' and 'Device Key' as you will need it later. So you know where to get this too. Once you have gotten the information stated above, download the attached code and look at the image below and change the values accordingly. Turn off the LinkIt ONE, if it is on, and set the small switch next to the battery plug on the LinkIt ONE to 'MS' and plug it in your PC again. Then open 'My Computer' and open the internal flash of the LinkIt ONE. There, create two different text files by right clicking in an empty location and selecting 'Text Document' from 'New'. Name it "wifi.txt". Open it and there, enter your WiFi SSID and password separated by a comma. Do not put spaces until and unless there is a space in your password or SSID, just for the sake of formatting. Images included below for reference. If you see output like the one below, there was a connection problem. Just re-plug the LinkIt ONE and open the serial monitor again. If it is like in the picture below for a very long time, then you have not entered your WiFi SSID or password correctly, or the the access point is is not in range. Enter that and then again upload the code, or move closer to the access point.. If you see this screen for a very long time, then there is an error with your WiFi SSID or password, or your are not in range of the access point. Re-enter the SSID and password or move closer to the network. If it gets past the 'Connecting to AP' but gets stuck at 'calling connection' for a very long time, like in the image below, then there is a problem with your SIM card. Make sure you have inserted it properly, or maybe it is not compatible with your LinkIt ONE. You will need to get a different SIM card if it does not work after trying a lot. When there is a successful connection, values start getting uploaded to it and appear in their respective places. Look at the video in step one for more information on how to use the bluetooth part. I will be adding more future updates to the project. This is because I want to install this permanently in my house. 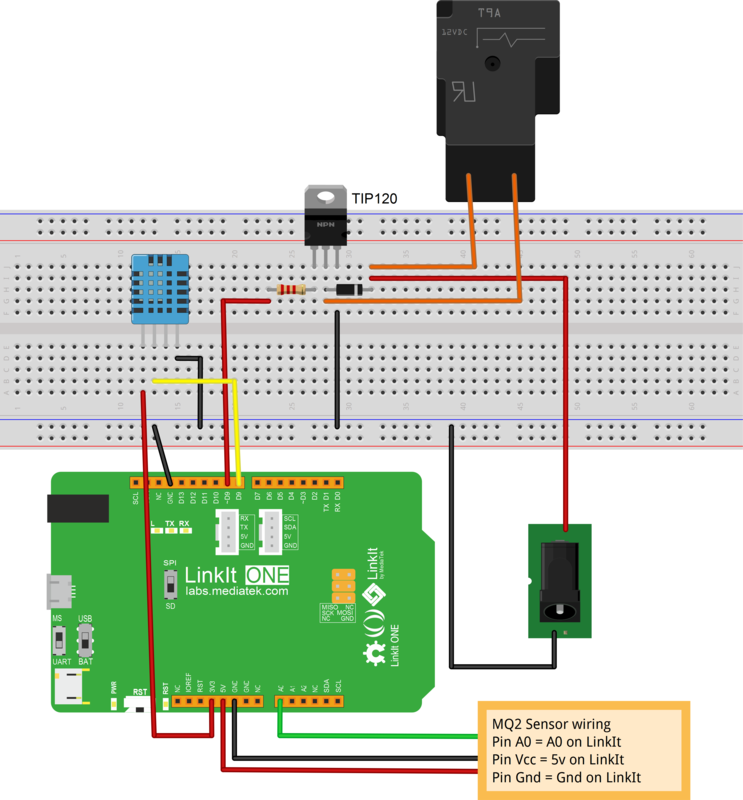 A feature I want to integrate in this is to save the sensor variables connected to the LinkIt ONE in an external SD card present on the LinkIt ONE, along with the time the data is logged. The time will be taken via GPS, and values saved as a text file with the time for each value next to it.